“In architecture, I had absolutely no role model,” said Norma M. Sklarek, the first African-American woman to earn an architecture license in the United States. In the mid-1960s, Sklarek moved to Los Angeles from New York to join the firm of Gruen Associates, where she became director. In 1980, she was the first African-American woman to be named a fellow by the American Institute of Architects (AIA) and five years later, she launched her own firm with two other women. 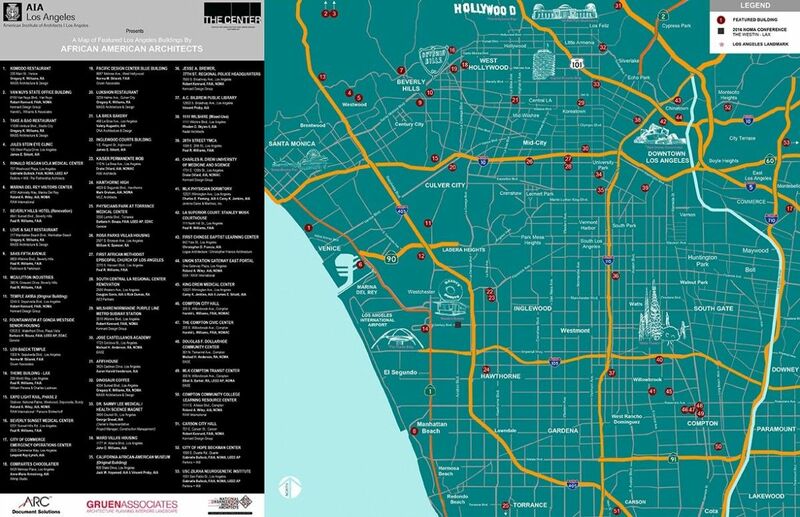 A new map produced by the Los Angeles chapter of the AIA marks over 50 buildings in the city with significant input by African-American architects. Until now, this history, which reveals an impressive breadth of projects, from colleges to hospitals, housing to civic centers, churches, temples, restaurants, and the iconic LAX Theme Building, was never collected into one visual. There has been other scholarly work done on African-American architects in Los Angeles, such as five oral histories (including Sklarek’s) archived at the University of California, Los Angeles. But the new map offers, in a glimpse, the span of these important contributions. The sites cover the city, from the coast to downtown, Beverly Hills to Venice, and Compton to the San Fernando Valley. 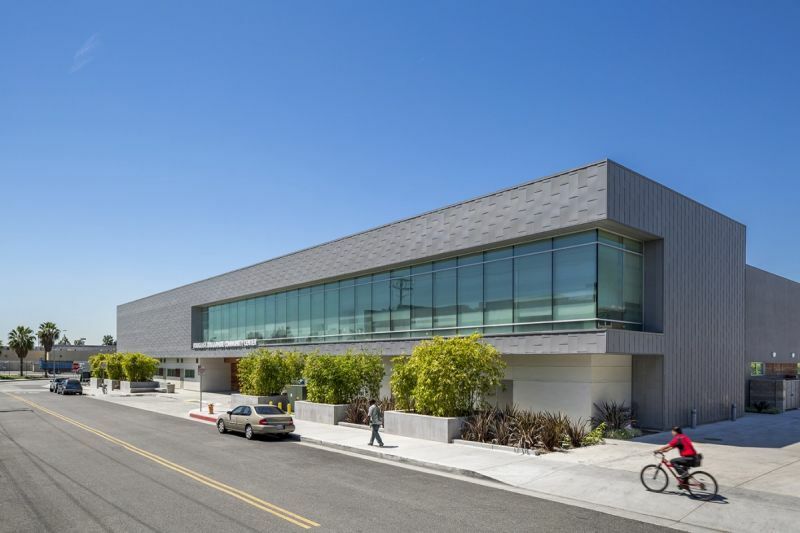 The map was the idea of Debra Gerod, AIA Los Angeles’s board president, and a partner at Gruen Associates. Anticipating the National Organization of Minority Architects’ annual conference, which was held in October in Los Angeles, she decided to do something tangible to celebrate the city’s lesser-known contributors. Her Gruen colleague Jason Morris enthusiastically took the reins, with assistance from high school intern Shaellen Franco. Morris and Franco combed through historic preservation databases, like the L.A. Conservancy’s, checked the websites of architectural firms, contacted city councils, and reached out to architects’ family members, who were grateful for the belated recognition. The National Organization of Minority Architects’ Southern California chapter also offered essential help, soliciting its members for their personal recollections. One discovery was a fascinating network of influence and mentorship radiating from Paul Revere Williams, the most famed and successful African-American architect in Los Angeles (as well as in the United States). Williams designed thousands of buildings both locally and nationally over a five-decade career. In 1923, he was the first African-American architect to join the AIA, and in 1957 was honored as an AIA fellow. Just last month, he was posthumously awarded the AIA’s 2017 Gold Medal — the first African-American to receive the organization’s highest honor. “That’s way past due,” says Gerod. Morris also notes that many of the projects on the map were built in minority communities. These areas were often underserved, lacking adequate hospitals, colleges, and civic and community centers. Examples on the map in the city of Compton include its City Hall and Civic Center (both by Harold L. Williams (no relation to Paul); the Douglas F. Dollarhide Community Center — named after the city’s first black mayor (by Michael H. Anderson); the MLK Transit Center (by Elliot S. Barker); and the Community College Learning Resource Center (by Roland A. Wiley). This group of important projects underscores the benefit of a diverse workforce of designers, who take all parts of the city into account. “The goal is to build a profession that’s as diverse as the community we serve,” says Morris. The political ramifications of an undiverse field was well elucidated in 1968 at the AIA’s national convention. Keynote speaker Whitney M. Young Jr. famously excoriated the AIA for its lack of diversity and silence around racial inequities, including the irresponsible construction of grim, prison-like public housing. He stated, “You share the responsibility for the mess we are in, in terms of the white noose around the central city. It didn’t just happen. We didn’t just suddenly get this situation. It was carefully planned.” In the wake of Young’s speech, 12 African-American architects formed the National Organization of Minority Architects.